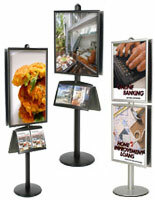 Looking for a way to advertise your brand with durable displays? Our metal poster stands showcase your graphics in a secure frame that preserves their professional presentation. These steel and aluminum signage holders are excellent for marketing your company's promotions in high traffic areas where other fixtures might get damaged. 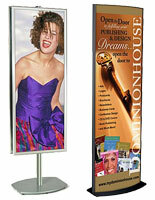 For this reason, metal poster stands are perfect for department store floors and busy trade shows. Our strong signs are offered in a number of finishes, sizes, and shapes to accommodate any business's promotional needs. 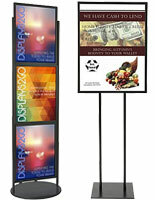 Find metal poster stands with brochure and catalog pockets for more branding opportunities as well! What types of steel and aluminum sign holders do we offer? 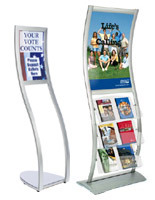 Metal poster stands are available in a wide variety of sizes. This is great for companies that already have their advertisements printed out. 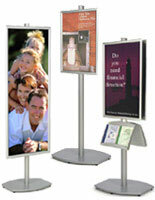 Browse displays for graphics as small as 8.5" x 11" and as large as 24" x 77". Large format ad holders are excellent for getting as much exposure as possible. Looking for a specific design to complement your surroundings? 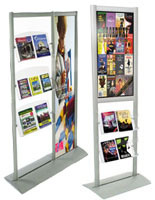 Our steel and aluminum poster stands come in a number of styles. Fixtures with a straight pole have a more traditional design that makes your organization look more professional. On the other hand, curved graphic displays have a more contemporary presentation that easily draws attention. Our Wave Series of signage holders features modern curvy signage holders that are sure to turn heads. 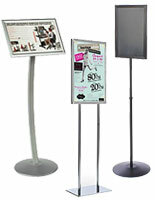 For poster stands with accessories, look no further than our FORTE and BRAVA series. This style of sign display features a modular design for creating versatile advertising fixtures. Both of these signage lines include units with varying numbers of graphic frames and literature trays for the perfect amount of promotional space. These models use snap-open print holders that make it easy to switch out advertisements. Whether you need a double sided display with lots of literature holders or a single sided fixture with a quick-change frame, we've got you covered. 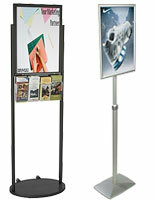 These promotional image stands feature different loading styles depending on their construction. Snap-open frames are one of the easiest to use and benefit organizations that need to change their marketing materials often. This style allows users to open the print holder from the front by rolling back the sides and removing the protective lens. Other designs use a simple slide-in design or are made to hang promotional advertisement sheets. 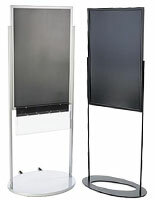 Aluminum and steel advertising stands are mostly made for indoor use, but you can find outdoor-rated displays by clicking on "Outdoor" in the features tab to the left. Alternatively, browse all of our durable outdoor graphic displays for sidewalk advertising and real estate promotion.